One cable. A world of possibilities. Unleash extensive possibilities with Toshiba’s Thunderbolt™ 3 dock for comprehensive, flexible connectivity for the devices you need most. 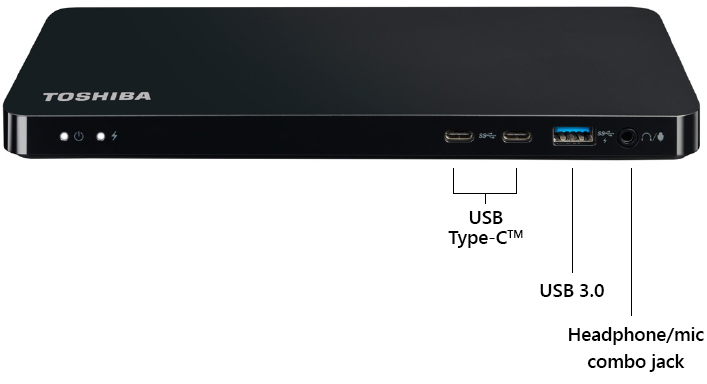 Connect to business essentials like the printer, monitors, keyboard, mouse, speakers and DVI output with just a single USB type C connection. 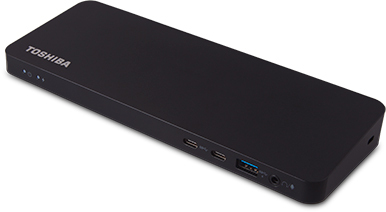 With 13 ports including 2x HDMI® ports, 4x USB 3.0 (1x with Sleep and Charge function), 2x USB Type-C™, 1x DisplayPort™, 1x Mini DisplayPort, VGA, LAN and a Headphone/Mic combo, the Toshiba Thunderbolt 3 dock eliminates the hassle of connecting multiple cables to your laptop. Transfer at high speeds of up to 40 Gbps (eight times faster than USB 3.0). At the same time, the Thunderbolt™ 3 dock will keep your laptop charged up through this one cable.